Here is a pair of FB 11" classics--Limited Edition circa 2008. The stag has a dagger blade, and the dark horn a bayo blade. 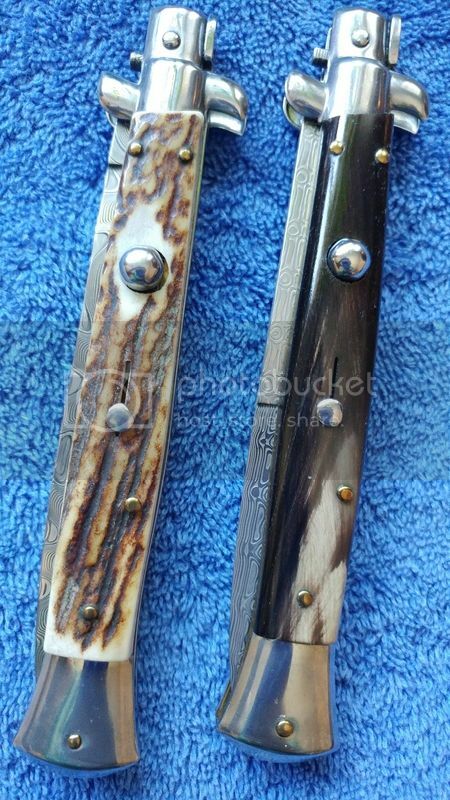 Whoever polished the blade on the buffalo horn polished the numbers off! Given the differences in the font sizes on the Frank B Italy tang stamps, I'll wager these were not part of the same edition. After the TSF sets, Frank continued to make these pics as the spirit moved but did not always date or otherwise uniquely identify them. Thank you for clearing that up for me, Natcherly! By the way, WHAT is your real name, again?? I have been away FAR too long, and my memory isn't what it once was! But most call me David! If I had to guess, David would have been it...maybe my memory isn't so bad after all! Thanks!